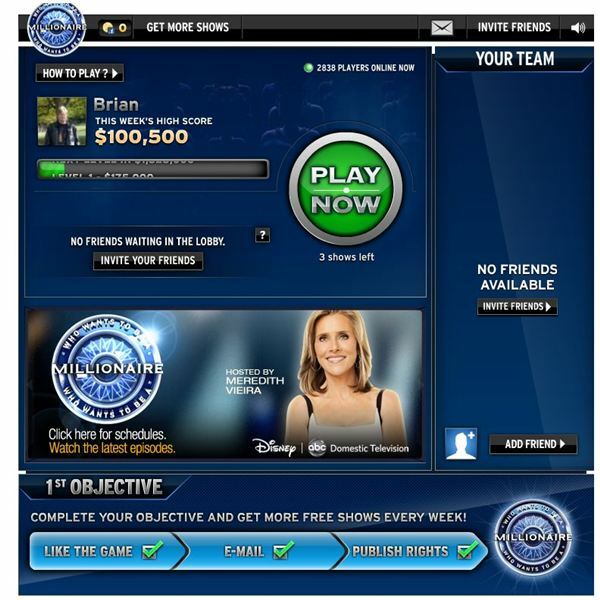 With Who Wants To Be A Millionaire on Facebook you can play the hit T.V. show. When you first play the game, you’ll get some free shows to start you off playing. 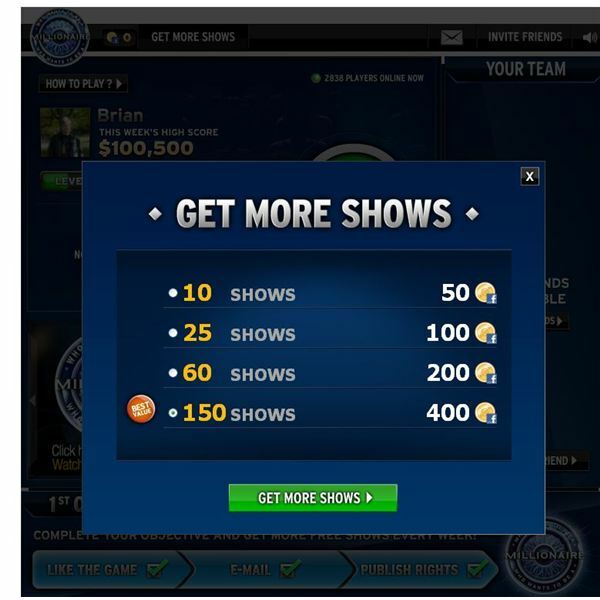 You can get more shows with Facebook credits if you want to play many games. You can get some free shows by subscribing, liking the game, and logging in daily. Players compete in shows with two rounds each. During new games, you can have two friends be your lifelines to help you answer questions correctly. During each round, you have four possible answers to each question. For the first round, players match against each other and you have ten questions to answer. After each player gives a response to the question, the prize money multiplies by the number of people who didn’t give the correct answer. The player who guesses the answer in the shortest time wins a bonus at the end of the round. In the second round, players will attempt to answer four questions at a harder difficulty from $100,000 up to the grand prize of $1,000,000. If a player can’t answer the question, they can walk away with any prize money earned up until that point. Just like the game show on T.V., you have lifelines to call upon. You’ll need Facebook friends playing to use them in your game. The jump lifeline in round one allows you to jump the question entirely. In round two you can ask the audience, which will post a wall message where your friends can answer the question correctly for a portion of the prize money. The question that your friends receive will be different from your question in the game. This lifeline isn’t available on the $1,000,000 question at the end of the game. You can select your lifelines by clicking on the lifeline symbol at the top of the screen. 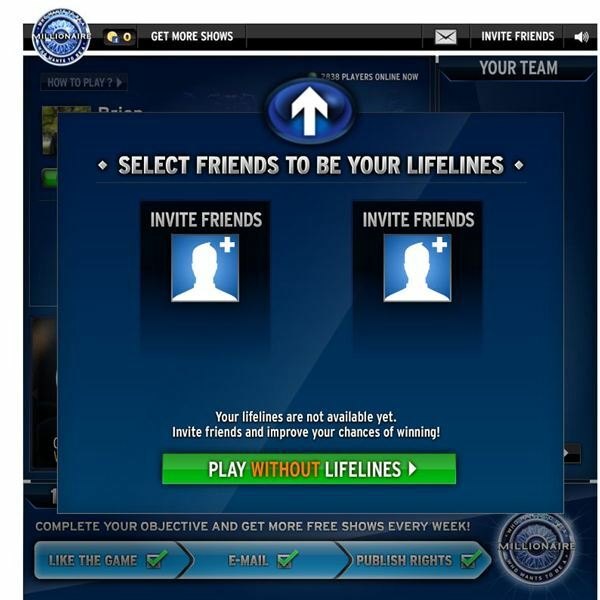 You cannot use lifelines unless you have friends playing the game so this isn’t a feature for solo players. 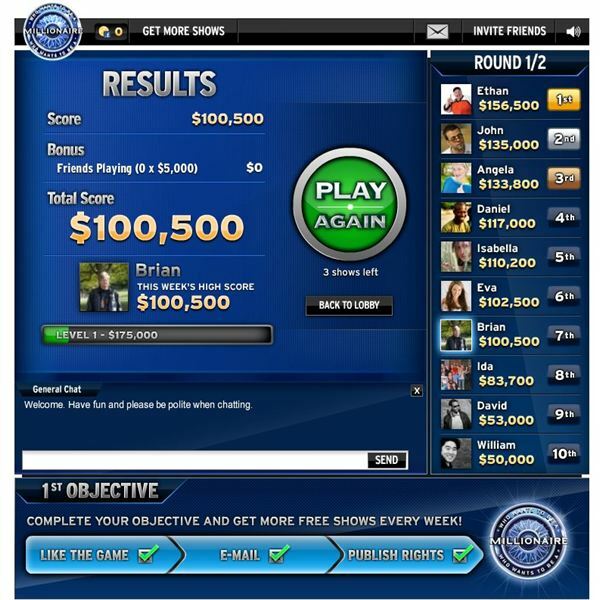 Who Wants To Be A Millionaire is a great Facebook game for those that like a challenge. You only have so much time to answer a question correctly and it's fun to compete against other players and see how you do. The categories are different each time you play so there will always be something to keep you on your toes. Getting to the second round in the game is very satisfying when you finally make it there. People who don't like answering questions on a timer may not like this game since you need to be quick with your response before it times out and moves onto the next question on the round. The game is also one you and pick up an and play when you have a few spare moments. You don't need to devote hours to playing the game like other Facebook games on the market. Keep in mind that this isn't a deep game you are just answering questions but it's competitive so that is the challenge. Who wants To Bee A Millionaire features average graphics but this isn't a graphic heavy game. You have the main lobby and the game play area when you are doing a round. The colors are bright and the text is easy to read. On the sound side there is a soundtrack but not much else. Overall the graphics and sound are average but they compliment this game well. Since you can compete against othe rplayers in the game for the top prize money the multiplayer aspects of Who Wants To Be A Millionaire are good. It's fun to see how well you can do against other players in each round. Players who like a challenge will enjoy the matchups against the people playing. If you make one mistake you can go from the top of the leaderboard to the bottom in short order. Who Wants To Be A Millionaire is a fun game for those who are a fan of the T.V. show. The game has a good mix of categories and questions and each time you play it is random. The casual aspect is great too since you don't need to spend endless hours playing like other games require. All images from Who Wants To Be A Millionaire. Source: Article is author's own experiences playing Who Wants To Be A Millionaire on Facebook.